Do certain restaurants hold special memories for you? Our family used to go Raku fairly frequently whenever we wanted to indulge in Japanese food that was nourishing and tasty at the same time. But with discovery of more choices (Chiharu! ), we have neglected visiting this place for almost a year. Complimentary starter- raw vegetables served with a special dip concocted by Raku. It’s really a mix of sugar, miso and sesame seeds to me. 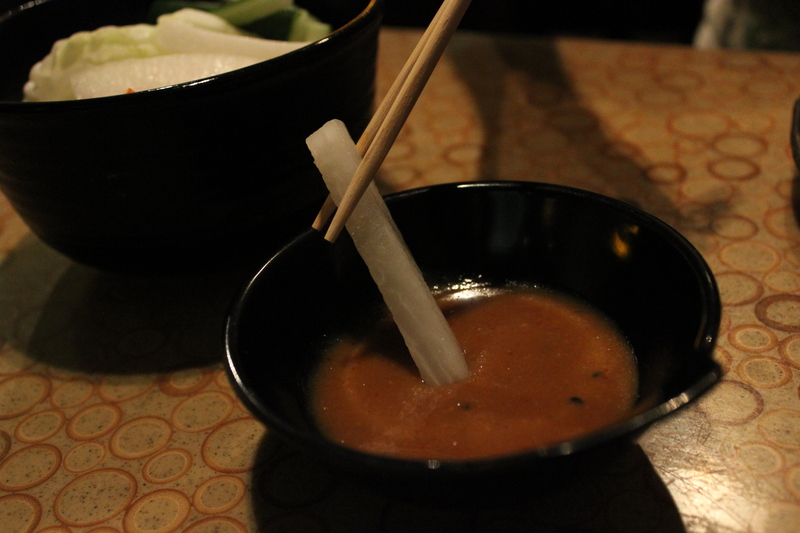 The cold and crisp vegetables naturally complemented the tasty miso dip. This stater is refreshing and the dip is extremely addictive(some people even buy the dip home). Not the type of starter that will fill you up so eat all you want! You get none of those tiny, deep,orangy-red cheapo ebiko (shrimp roe). The california maki here is drenched with the more sophisticated tobiko (flying fish roe) which is not only more visually appealing especially when this bright orange roe shimmers under the spotlight, but also bursts open to reveal a more complex flavour that is more than just salty as you crunch on it. Unfortunately, the maki that day was made quite sloppily plus the rice was not vinegared as well as before leaving me very disappointed. Woah this was EXPENSIVE. It cost about $100+? but oh boy, it was spectacular, nothing we ever tasted or saw before- even in Japan! 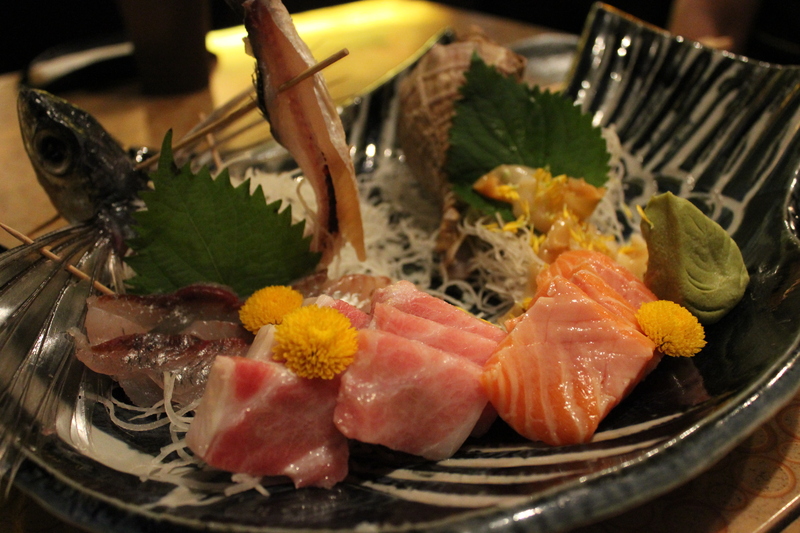 This sashimi platter consisted of thinly sliced flying fish, thick slabs of sinewy otoro(premium tuna belly), thick slabs of salmon from norway and topshell sashimi. My favourite would have to be the flying fish. It’s less fatty, had a very sweet flavour to it with a smooth texture. I can’t really describe it well because of its unique flavour. 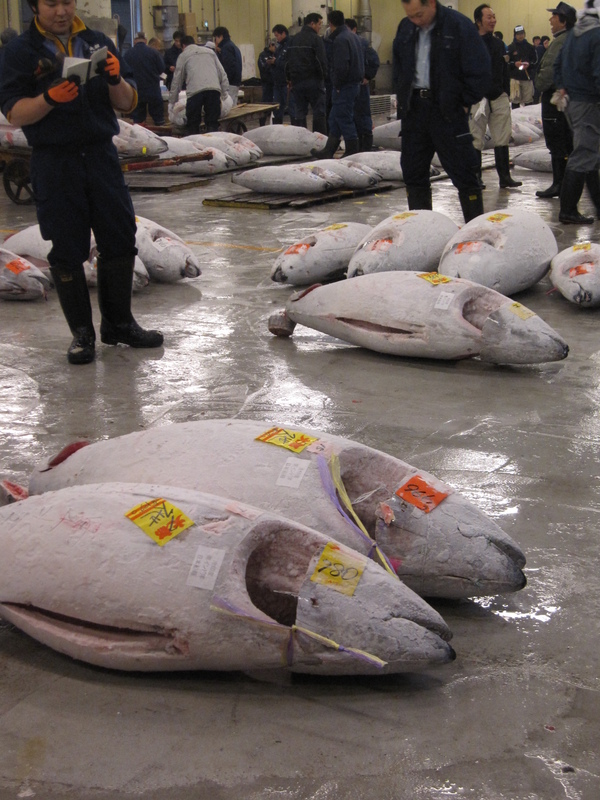 As we slowly savoured on the otoro, we chuckled over our little adventure in Tsukiji Market. Dad was being chased out by an auctioneer as he sauntered out of the viewing area into the auction grounds! Thank goodness we didn’t understand any of the words the auctioneer hurled at him, hahaha. 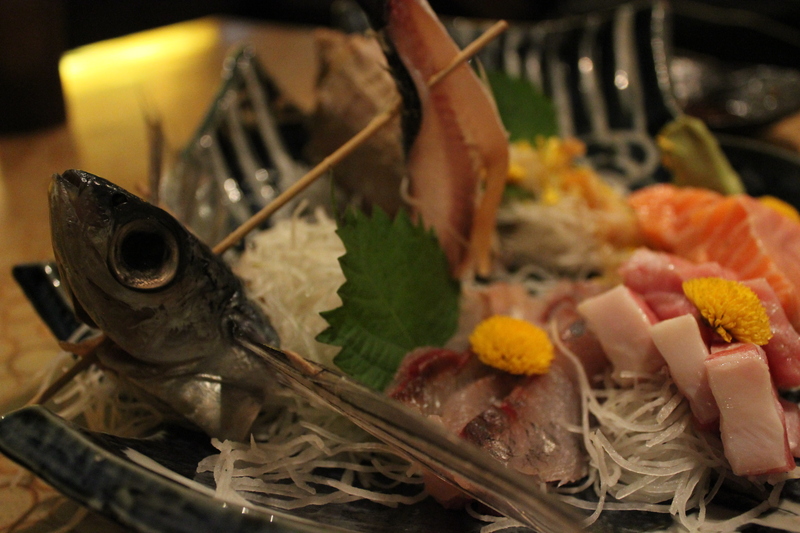 Our waiter slowly explained to us each and every type of sashimi on our platter. The otoro, he told us, was as premium as it was going to get. It looked so much like meat! 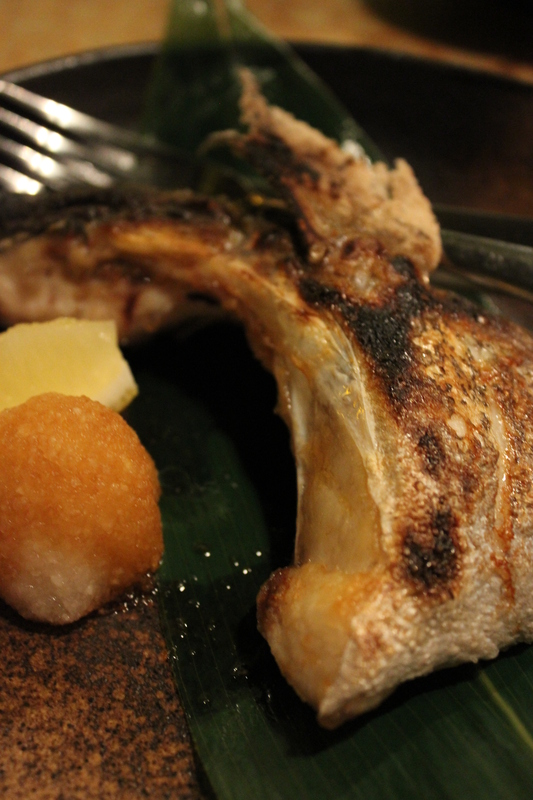 The lines of fat made it such a melt-in- the-mouth experience that we knew, this was the best otoro we ever had in sg. Salmon was fresh and the oily omega-rich flesh was well received as usual by the family. Topshell was another interesting addition that I never had before. It was killed just moments before as the flesh becomes tasteless not long after. The texture is very crunchy, with a slightly fishy smell that some people might not get used to. I liked it nonetheless because the unique smell didn’t really bother me. I jokingly said we should keep the shell and dad took it seriously, it’s now sitting in our toilet! Special mention goes to the delicious wasabi paste delicately carved into a leaf. It was smooth and every bit of it contained heat so intense that it made me tear at one point. 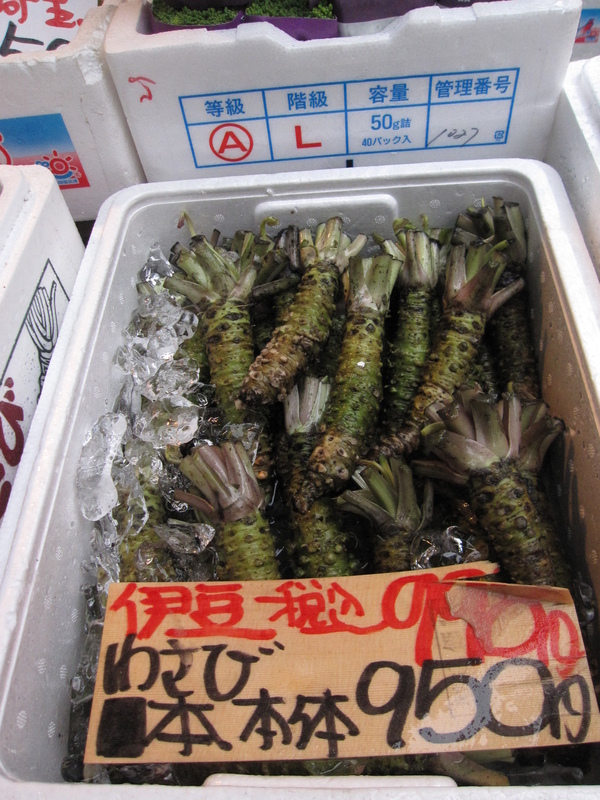 We saw the original wasbi root in Tsukiji market too. Garlic rice comes in individual portions. 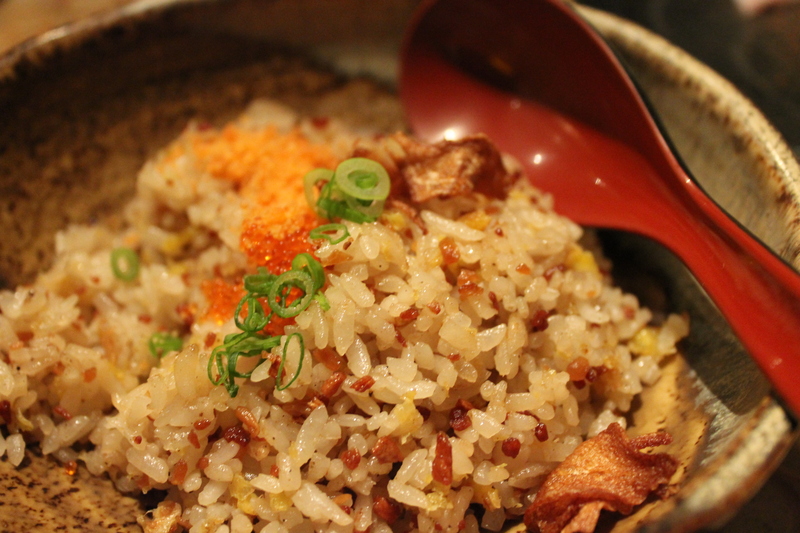 Each grain was fluffy and the ingredients were well incorporated into the rice. The deep fried pieces of pink ginger sprinkled on top and that little bit of tobiko were more than just simple garnishes. They added new flavours to this dish making every spoonful a delight. This is another order that we always have in every visit. 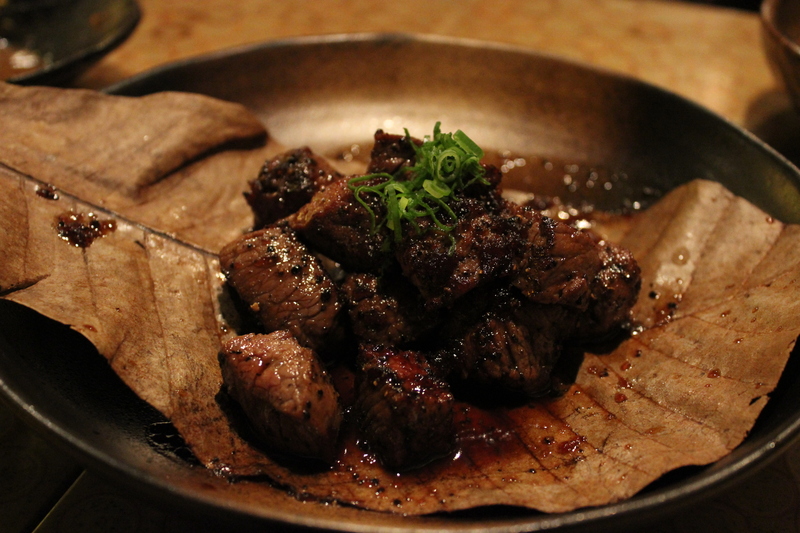 Succulent chunks of Waygu beef with that characteristic beefiness we will never get tired of. 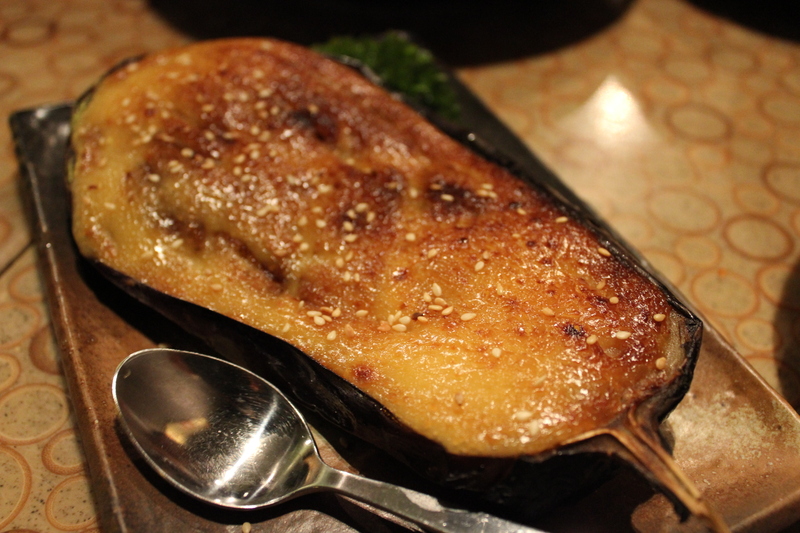 In addition to the miso paste, cheese is added to makethis grilled eggplant extra guey. It may be a messy affair but the pairing with garlic rice makes it tasty comfort food. I prefer the one at chiharu which is less savoury with the lack of cheese- it’s a personal preference. 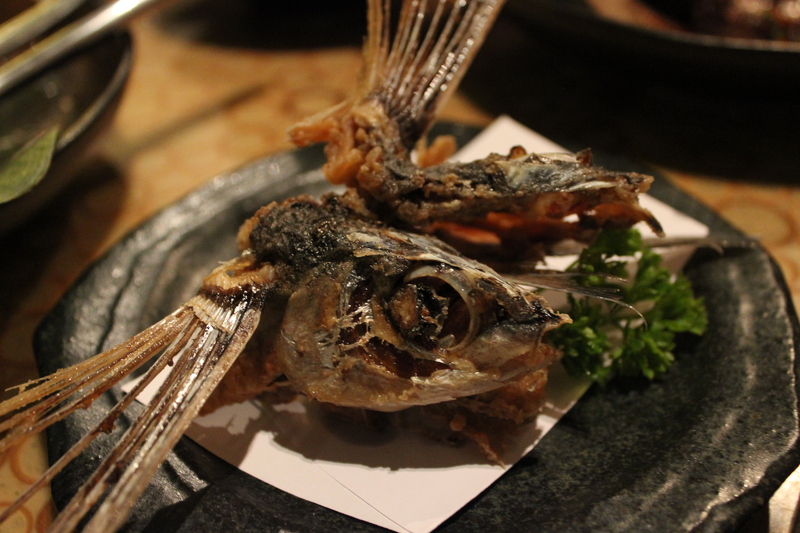 The flying fish decoration you see on our sashimi platter was deepfried for consumption. The bones were surprisingly soft and edible. Each piece was like a hard crunchy piece of potato chip, very nice. This again brought back funny memories in tokyo when we were in a sake bar trying to order yellowtail fish collar like the one you see above. Our waitress grinned and told us there was no such thing. Maybe all of it gets exported to Singapore? hahaha. Either that or it was miscommunication in some way. Raku serves a much better rendition than chiharu. The flesh remains sufficiently moist and for whatever reason there is more meat in the collar. Nothing like something sweet to end the meal. Usually people get fresh fruit, one small slice of watermelon and rock melon but being regular customers, we got sesame ice cream too. 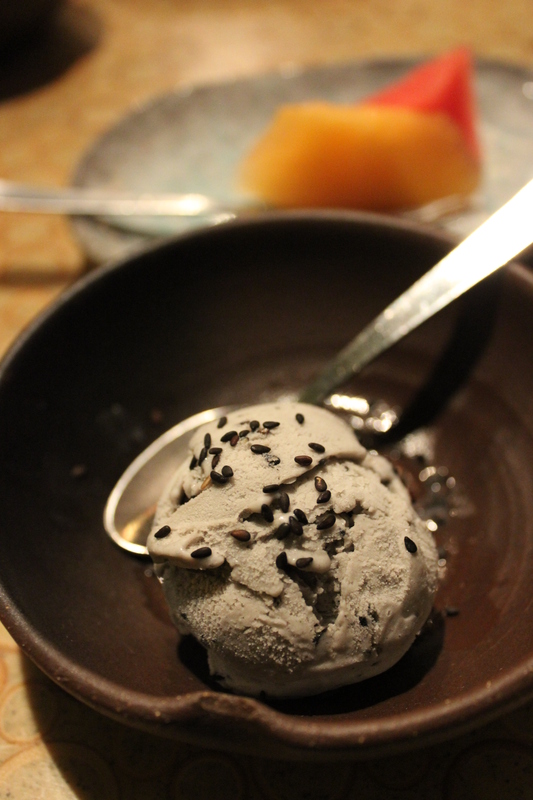 The black sesame seeds sprinkled on top really upped the ante by making the sesame flavour stronger than before. 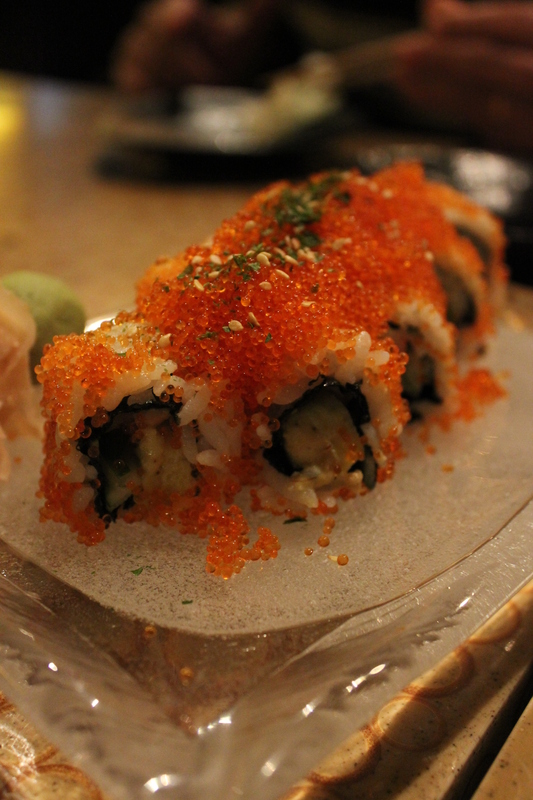 Raku still remains as a family favourite, somewhere we will go to whenever we are craving for japanese food!